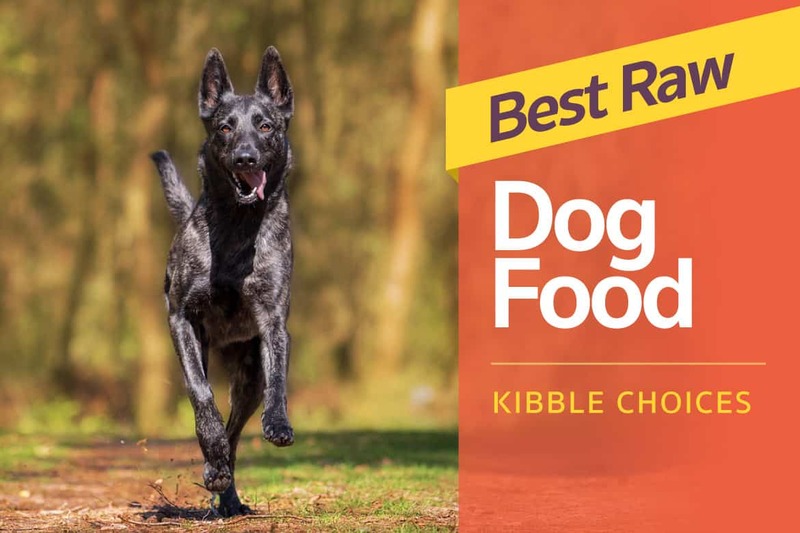 A Comprehensive look at the raw food kibble choices to make Fido’s tail wag: a closer look at the ingredients, reviews, and price points of the 4 best raw dog food products in the market today. The raw diet trend for pet dogs is on the rise, as many dog owners grow anxious about news stories about dog food recalls. While proponents tout its benefits, raw food for dogs comes with certain risks too, and it's best to be aware. When you decide to give your dog a raw diet, that usually means researching dog nutrition and raw dog food recipes, shopping for ingredients, and making the food yourself. For both freeze-dried or frozen raw dog food, there aren’t too many ready-to-eat choices out there as the raw pet food market hasn't fully developed as of yet. However, the raw dog food options that you do have are pretty sweet, enough to make those puppy tails wag and mouths water. When you’re looking to take a break from your doggie chef duties, we’ve got you covered with the top 4 best raw food choices you can buy for your furry friend. If you’re looking for a top-rated raw dog recipe options, you’ve found it with Stella & Chewy's Freeze-Dried Dog Food! With an ingredient list that starts with grass-fed beef, organs, and bone, your pup is guaranteed to enjoy nature’s finest dry dog food. You will also get a dog food that is 100% made in the USA—so you're sure the raw meat and vegetable ingredients are not sourced from dubious suppliers from across the world. What’s even better? This raw dog food is perfect for all stages of life for your precious pup—puppy, adult, and senior. 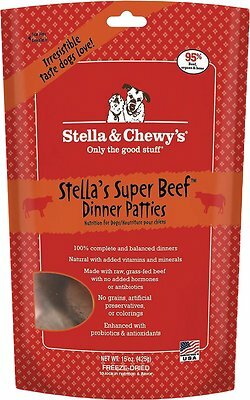 Stella & Chewy's Freeze-Dried Dog Food also allows your dog the greater ease of digestion and relief from allergic reactions (itching, dandruff, etc.). This is a great choice for your tail-waggin’ friend if you’re looking for a raw diet with a style of natural homemade dog food. 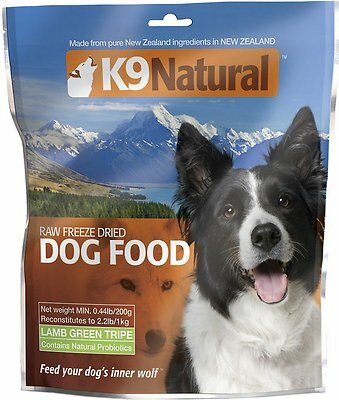 K9 Natural Raw Grain-Free Freeze-Dried Dog Food is another great option for raw food for your furry friend. The recipe is 100% natural and appropriate for your dog, which cannot be said about many raw food diet dog foods on the market. No artificial preservatives, additives, or grains are used in K9 Natural Dog Food, which is comforting for pet parents who have fur babies that suffer from allergies. This is the perfect kibble for your pup that is active and energetic and needs a food that keeps up with him! If you’re looking for the best freeze-dried raw dog food without any of the grains or gluten that can really cause problems for your furry friend, this is the perfect dog food for them! 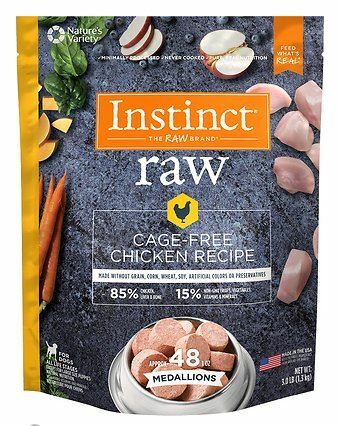 Instinct by Nature's Variety Raw Market prides itself on using cage-free chickens and 100% organic fruits and vegetables. You will be super pleased with this raw dog food and all of the amazing nutrients that are offered to your pup. 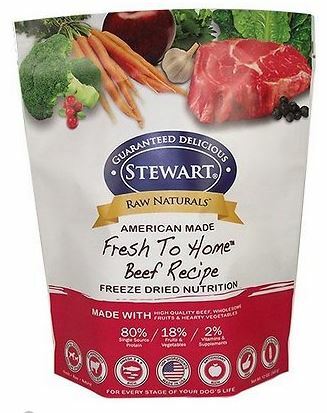 Stewart Raw Naturals Bison Recipe Grain-Free Freeze-Dried Dog Food is a raw, freeze-dried dog food that brings you and your pup the best of the best in raw nutrition—high protein from raw meat, fruits and vegetables, and grain- and gluten-free! With antioxidants and vitamins and minerals that are bound to keep Fido in tip-top shape, Stewart Raw Naturals Bison Recipe Grain-Free Freeze-Dried Dog Food is one of the best raw dog food choices you could possibly feed your beloved furry member of the family. As you can see, there are good options for the raw dog food on the market today, and that can make it hard to pick the perfect raw kibble for your pup. Knowing the ingredients that are included in the recipes, the reviews from other customers and quality in relation to price point are huge when making a decision about which is the best food for your dog. These are the top 4 choices in the market today, but remember there are other great choices on the market, and every dog reacts differently to every food! Take your dog back to nature and feed him one of these amazing raw dog food choices—your furry friend will thank you. Visit this page for food that your dog mustn't eat and those that are safe to eat. Click here to read our comprehensive article on dog nutrition.